Welcome to giveaway #2. If you aren't already part of the party, then all you have to do is click here. If you missed giveaway #1 then you need to click here. I am really enjoying my visits to your blogs. You have taken my 5 simple questions about your attendance at the party and made it really fun! All of the food sounds wonderful. Visit the different bloggers in the first link above and you can see some yummy recipes. The ideas for activities sound like fun. 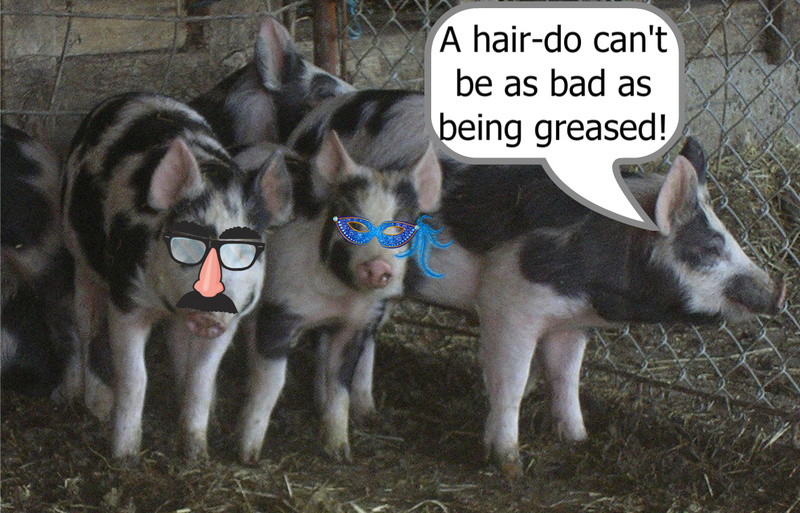 I'm not sure our pigs will like being greased, but maybe we can mousse them and give them a new "do"! Mr.Pig says,"Besides, I think they'll figure our who you are. Party guests? Right! You two look stupid. Can't I just eat the glasses?" I got this pretty necklace at a craft table with this giveaway in mind. silver clasp in this photo on the upper right. I believe it is an 18"
lovely piece of costume jewelry. Hint: Giveaway 3 will not be jewelry! Gosh I don't know where you get the energy. It all looks good and I love your pig picture. P.S. I was looking at all of your recipes, reason 160 why I like you, you cook!!! The White Lasagna looks like to die for and I am going to cook the Ratatouille. Haha- your poor chickens need some flight lessons!! I never thought mine could move far till I saw a hawk going after it- it was a WILD flying frenzy! (till I ran outside screaming even more wildy at the hawk to leave my poor chicken alone!) :) He's never come back since! I just voted again, don't worry about shipping out to me, I just like joining in. hello, im a new follower from the wed. blog hop, would love to have you follow me back! Pretty! I would give this to my mom if I win. I follow your daughters blog. I'm your newest follower off of Wandering Wednesday and would love a follow back! Your blog is adorable! Nice job!